One of Kenya's major tourist resorts, Lamu, has been hit hard by the recent kidnapping by Somali gangs of two Westerners - a disabled French woman and a British tourist. With tourism accounting for some 10% of Kenya's economy, there are fears that the whole country could be affected, as the BBC's Will Ross found when he visited Lamu. On the seafront of Lamu old town, the boatmen are asking the same questions: "I take you to Shela beach? ", "You want a dhow [traditional sailing boat]?". But with so few takers, there is desperation in the voices. Just across the channel on Manda Island, a team of workers was building a barrier to try to stop the sea from "stealing" more of the idyllic beach front. But now, they face a man-made menace from Somalia which is threatening this tourism-based economy. "That night, I heard people screaming on the beach and running away. I heard a gunshot and then I heard the sound of a small boat engine leaving slowly," Stefano Moccia, the owner of the Majlis hotel told me. In the early hours of Saturday 1 October, Marie Dedieu was seized from her rented thatched beach-front home and dumped into a waiting speedboat. The gunmen took the 66-year-old French woman to Somalia, leaving behind her wheelchair and vital medicine. "I called everybody. The police in Lamu were not picking up the phone. I managed to speak to another one on the phone at the border. For sure, the police were not efficient that night because it had never happened before - it was the first time," said Mr Moccia who noted that since the attack, the government had tightened security. "In the last 10 years, I've been staying here and I never had any problem, not even a robbery, so it was completely unexpected." Most hotels around Lamu immediately received a flood of cancellations, and many owners have been forced to send at least half their staff home, fearing the next season will be a write-off. When I visited the luxury Majlis - where the likes of Angelina Jolie have stayed in the rooms which go for between 500 (£430) and 1,000 euros (£870) a night - the place was deserted. One British tourist was on the way despite his government's amended travel advisory. "I am very worried as we depend entirely on the tourism for our income. I use the money I get from the tourists for food and school for the children as well as medical care," said Muhammad, who has been taking visitors around by motorboat for 18 years. At dusk, three small boats with armed soldiers and policemen set off on patrol, dropping guards at various beaches. In sleepy Lamu, this is an unusual sight, but one which is meant to send out the message that mistakes have been learnt and security is tight. This setback comes just after the industry had recovered from a 20% slump in earnings as a result of the widespread clashes which followed the 2007 election. Last year was a record, with more than one million tourists visiting and bringing in the equivalent of almost $1bn (£640m). "Tourism is 10% of our GDP and 9% of the formal workforce. So it is substantial money that cannot be ignored," Tourism Minister Najib Balala told the BBC. "The president has called three National Security Council meetings - these are not meetings that are held any time. They were called because the economy is under threat and the country's border needs to be secured." British tourist Judith Tebbutt is also being held in Somalia after gunmen struck the remote beach resort at Kiwayu near Lamu, killing her husband. Some analysts believe Somali pirate gangs are looking for alternative ways of securing hefty ransom payments apart from targeting the merchant vessels at sea. The pirates are no longer just operating out of bases on the northern Somali coast, like Harardhere and Hobyo. With reports of increased co-operation (and sharing of ransoms) with the Islamist insurgent group al-Shabab, they are now hiding out on the small islands just off the coast all the way down to the Kenya-Somalia border, leaving the Kenyan beaches far more vulnerable especially as the monsoon season is ending. "The sea conditions are improving all the time; we think there are up to 70 pirate action groups sitting waiting to go to sea or already at sea on motherships waiting to begin the attacks," said Colonel John Steed, the head of the UN's counter-piracy unit. "We're expecting a period of increased activity in coming weeks," added Col Steed, who stressed the need to look at alternative ways including pre-emptive attacks to break up the pirates' lucrative business mode. "The pirates are at their most vulnerable when gathering their fuel, logistics and boats on the beaches, and I'm sure my military colleagues in the various anti-piracy task forces are considering options to prevent the pirates going to sea in the first place," said Col Steed, who is also the military adviser to the UN special representative on Somalia. Attacking the pirate bases is unlikely to happen soon and would require a change in the rules of engagement. It could have consequences for the 300 people currently being held hostage. 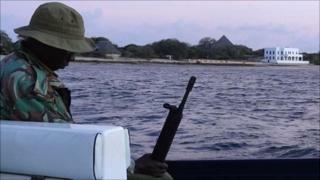 Around Lamu, there are questions over the ability of the Kenyan navy and police to outwit the experienced and daring pirate groups. It is now a waiting game as people pray the worst is over. "It's going to take time to get the tourists back, but everybody considers this place as a paradise, so it's a matter of regaining back the confidence of the tourists and we'll be back in business," said Mr Moccia as an immaculately dressed barman polished the glasses hoping they, like the hotel, would soon be full.